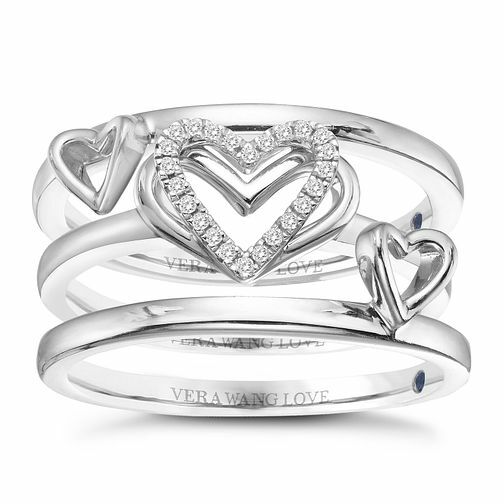 A beautiful and fashionable set of 3 stacking rings from the Vera Wang Kindred Heart Collection that feature a heart motif studded with diamonds that expands in different directions with Vera Wang's signature sapphire in the shank; a brilliant symbolic gesture of how love can capture the heart. Vera Wang Sterling Silver Diamond Stacking Rings Set is rated 5.0 out of 5 by 1. Rated 5 out of 5 by Anonymous from Amazing The box alone is amazing ..... this sparkles and is so beautiful and delicate. I love it.